For Hotel and Restaurant information, visit Old Town Cosmopolitan, an authorized park concession. Reminiscences of Susan Davis Tiffany, a resident of the Bandini house from 1898-1911. 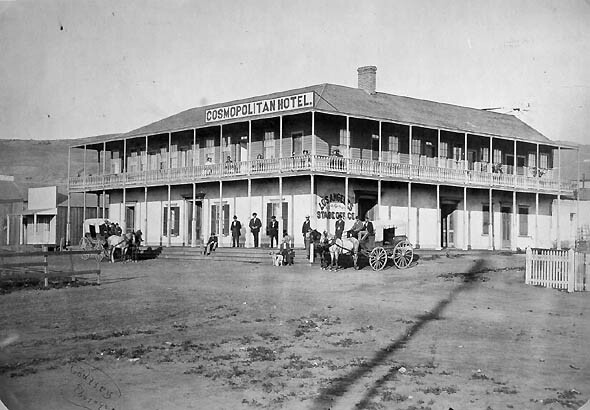 "Memory Like the Ivy Clings"
Cosmopolitan Chronicle - True tales from the annals of history, archaeology, construction, and restoration of the Cosmopolitan Hotel & Restaurant / La Casa de Bandini building. Revised versions of No. 11, 12, 15, 18, 20, 22, 23, 24, 25, 28, 29 were posted 10/1/08; No. 19 & 21 posted 10/30/08. A collected version of Volume 1 of the Cosmopolitan Chronicle was posted 9/30/13. This version is a large file so it may be easier to download for viewing. A collected version of Volume 2 of the Cosmopolitan Chronicle was posted 10/4/13. This version is a large file so it may be easier to download for viewing. A collected version of Volume 3 of the Cosmopolitan Chronicle was posted 10/8/13. This version is a large file so it may be easier to download for viewing. A collected version of Volume 4 of the Cosmopolitan Chronicle was posted 10/9/13. This version is a large file so it may be easier to download for viewing. Project duration 365 calendar days from notice to commence. Furnish all labor, materials, tools and equipment necessary for the seismic stabilization (SS), restoration (RES), rehabilitation (REH), and reconstruction (REC) of the historic Cosmopolitan Hotel and Restaurant. Work includes, demolition of non-historic building additions and wall/flooring finishes, SS of the adobe first floor walls and wood framed second floor, REH of a low retaining wall, RES and REH of wood floors and decks (verandas), RES of wood fenestrations (1st and 2nd floor verandas and interior), REH of siding, RES of interior baluster stairway, REH of interior electrical and plumbing, REH of exterior underground electric and water service utilities, wood framed elevator shaft and penthouse for accessibility compliance, second floor wood stairways for life and safety compliance, REC exterior steps, REH and RES of doors and windows, REC of interior finishes, REC of interior ceiling, RES of historic roof including abatement of asbestos containing felt. Archeological monitoring of demolition activities will be provided by State.